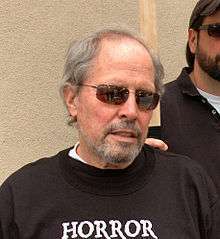 David Seltzer during the 2007 Writers Guild of America strike. David Seltzer (born 1940) is an American screenwriter, producer and director, perhaps best known for writing the screenplays for The Omen (1976) and Bird on a Wire (1990). As writer-director, Seltzer's credits include the 1986 teen tragi-comedy Lucas starring Corey Haim, Charlie Sheen and Winona Ryder, the 1988 comedy Punchline starring Sally Field and Tom Hanks, and 1992's Shining Through starring Melanie Griffith and Michael Douglas. Born to a Jewish family, Seltzer was uncredited for his contributions to the 1971 musical film Willy Wonka & the Chocolate Factory, the author of the original book, Roald Dahl, is credited as sole screenwriter; however it has been revealed that Seltzer rewrote 30% of Dahl's script, adding such elements as the "Slugworth subplot", music other than the original Oompa Loompa compositions (including Pure Imagination, and The Candy Man, and the ending dialogue for the movie. Seltzer's writing credits include the screenplays for The Omen, Prophecy, Six Weeks, My Giant, Dragonfly and Bird on a Wire, starring Mel Gibson and Goldie Hawn. He wrote and directed Lucas (1986), Punchline (1988), Shining Through (1992), and Nobody's Baby (2001). Seltzer was reported to be writing an "Untitled Earthquake Project" for Hollywood director and producer J.J. Abrams, the plot of which is closely guarded, though it has been confirmed that the film is not a remake of 1974's disaster film Earthquake. Seltzer is also reportedly working on a UK remake of Alfred Hitchcock's Strangers on a Train, from the novel by Patricia Highsmith. ↑ Erens, Patricia (August 1988). The Jew in American Cinema. Indiana University Press. ISBN 978-0-253-20493-6. ↑ Pure Imagination: The Story of "Willy Wonka and the Chocolate Factory". Two Dog Productions Inc. 2001. ↑ Kit, Borys (2008-12-08). "J.J. Abrams in for Earthquake Film". Hollywood Reporter. Retrieved 2010-04-05. ↑ Knowles, Harry (2002-02-20). "Remake of Alfred Hitchcock's Strangers on a Train". Ain't It Cool News. Retrieved 2010-04-05.